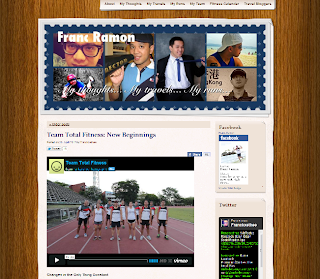 Blog Description : Francramon.com is a collection of my everyday life experiences, my travel adventures and my runs and living a life as an athlete. It's written in the me-perspective and in sharing a portion of the experiences I have, I try to have the readers indirectly experience the stuff I go through whether it's a high or a low or just an adventure waiting to happen. About the Author : I’m a Franc of all trade. I’m a CPA and Finance person by profession and I do get my fair share of corporate headaches and pressures but other than that I’m now firmly attached to the finer side of life. I train, I run and I race. Running has now been a part of my lifestyle and so is the endless chase of new personal records, longer distances, various terrains and new challenges. I travel… for work, for fun, for rest or just to explore new frontiers. I’m such a free spirit when it comes to travel and I probably have one foot forward when it comes to going for new adventures. I’m a thinker. I have my point of view to absolutely everything under the sun. I’m creative enough to come up with new ideas no matter how crazy it is. What's your inspiration behind your blog and how long was it around? I started blogging in 2003 and have over 500 blogs since then but it's more of a chronicles of my day to day life. Late last year, I decided to merge everything in a single dot.com site and hence, Francramon.com was born. It was also last year that I was more active in promoting my site. Writing is one of my passion ever since I was in high school and I've been with the school paper since high school and even becoming Editor-in-Chief in college yet writing was never my career as I eventually and successfully had a career in Finance. Blogging was a way to get back to the passion of writing. I always loved writing and I started blogging via friendster blogs as a way to get back to writing. I eventually decided to shift to blogspot a few years later and eventually added a travel and run section to chronicles my adventures. Everything is now consolidated at Francramon.com. My favorite blogpost was a feature I wrote about Bellarocca which was my first blog that had around 300 hits, prior to that I used to just have few friends reading my post. The article also got featured in a travel mag. This was also one of the reason for creating francramon.com to be able to offer my blogs to a bigger market. Now, I am a contributor for a sports magazine and I'm back to my original passion of writing. Currently, I love my run blogs at it allows me and the runners in the race who reads it to re-experience the intricacies of the race. It's one of my most read blogs and one blog about Outbreak Manila was able to generate about 1,500 hits. 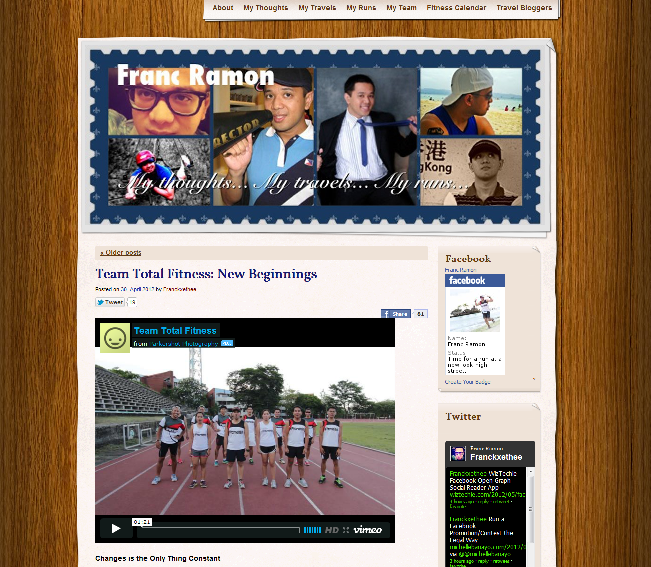 Keep on running Franc and more power to Team Total Fitness. Great to know more bloggers that are passionate about other things! Keep running! It's nice to know this man! Hoping to meet him 1 day and have a cup of coffee! 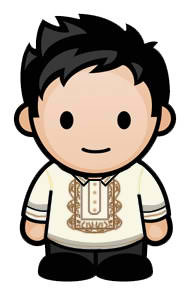 Keep on blogging and inspiring "tukayo"
Thanks for the feature Ms. Tess. Thanks for the comments guys! Great feature on sir Francis, mami Tess! :D It's so nice to read new and interesting things about fellow bloggers. I am an admirer of this blog and the blogger behind this site as well. Oh, I've visited Francis blog several times! It's one of the blogs I've bookmarked because we share the passion for running. This is an inspiring feature. I read the Bellaroca post and it's nice that someone spilled the beans of such hidden paradise. Marinduque is still an estranged place to me, but you made it known and close to my bucket list. havent visited his site, well i should! Nganga aq sa 500 blogs hah! will check his blog after this, interesting! Ways loved writing and have started on Friendster as well. great job ms. tess for featuring bloggers in your post! nakapila me ha? I remember writing a blog in Friendster blogs too. I also got a hang on blogging through Friendster blogs somehow. I can't run by I support the advocacy of some sponsors like Chevron, Enervon, etc. Keep on running!